"Industry did not escape the consequences of the global economic crisis; the crisis particularly affected television advertising revenue. Nevertheless, IDATE predicts that the market will exceed its 2008 level in 2010", comments Florence Le Borgne, project leader of this report. · The United States remains the largest television market in the world with turnover of more than 100 billion EUR in 2009, declining 2% in a year. 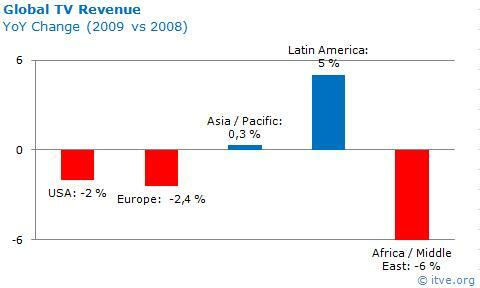 The importance of the North American region in the worldwide market is trending downward, going from 39% in 2006 to 38.7% in 2009; it should continue to lose a few tenths of percent in the years to come. · The second largest regional market, Europe had a turnover of 82 billion EUR in 2009, a decrease of 2.4% compared to 2008. The importance of the European market in the worldwide market also showed slow erosion, going from 31.7% in 2006 to 30.5% in 2009. The United Kingdom, Germany and France attracted the most market growth and between them account for 44% of the region’s revenues. · Asia/Pacific recorded growth in its TV market on the order of 0.3%. Its market share grew by 0.3 points and regained its 2007 level, at 20.8%. The heavyweights in the region, Japan, India and China experienced varied results. As a mature market, Japan showed a decrease of more than 5% while the Chinese and Indian emerging markets grew 6.2% and 9.5% respectively. · Latin America displayed the greatest growth in its TV market, with an increase of nearly 5%. 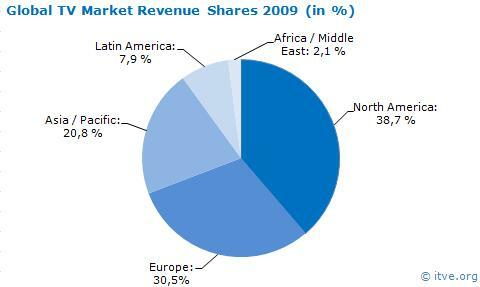 Its market share in the worldwide market is still small (7.9%), but it is growing consistently (6% in 2006). 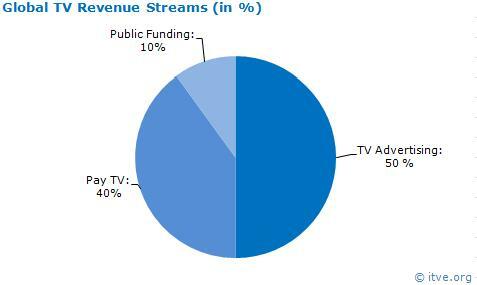 Brazil is the largest market in Latin American TV and alone makes up more than 45% of the market. · The smallest regional market, Africa/Middle East declined by more than 6%. Its market share has stagnated at 2.1%. The worldwide television market was, in 2009, primarily affected by the decline in advertising revenue of 9.2%, which could not be compensated for by paid television or public funding; these two sources of revenue increased 7.2% and 3.5% respectively. Up until 2008, advertising was by far the primary means of funding for the industry, generating about 50% of the sector's revenue, compared to 40% for paid television and 10% for public funding. 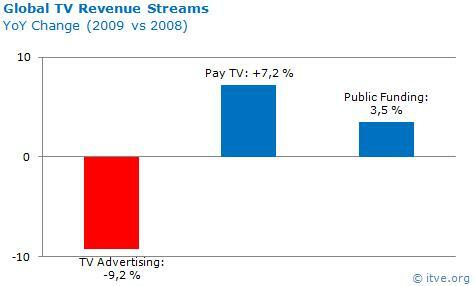 In 2009, the weight of advertising and subscriptions each accounted for about 45% of the sector’s revenue. By 2010, revenue from paid television should exceed overall advertising revenue worldwide, reaching a ratio of approximately 47%/44% by 2013. Download IDATE's Press Release or visit IDATE for more information.